On Monday’s The Five, Jesse Watters commented that, because Chuck Todd kept pressing Donald Trump about his plan to deport every illegal immigrant yesterday, he might as well set them up in his own home. Dana Perino forcefully pushed back, saying that while people might like the sound of Trump’s plan, it will not not solve the country’s problems, even if it was possible. Perino also took issue with Watters and Tim Shillue‘s indulgence of Trump’s plan to revoke the Dream Act. “I would love to see you and you have to go find some families and round them up and say, ‘sorry, I know you’ve been here and your kids were born in the Bronx, but you’re from Costa Rica and you’re out of here,'” Perino said. Watters responded that it was not unusual for politicians to make promises on the campaign trail, and that Trump might not even have a chance to revoke Obama’s executive order if the federal courts get there first. To this, Perino said she was surprised of Watter’s approval, saying that Trump’s attempt to do so will be reminiscent of President Obama’s “imperial presidency,” and that he should hold Trump accountable as a journalist. 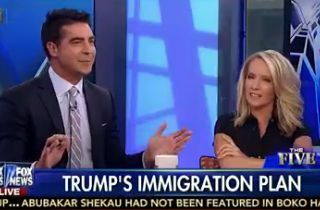 The rest of the discussion saw Perino pressing him to admit he called to round up migrant families, while Watters emphasized that he just likes the idea of Trump’s border plan.